Contact Irish Water regarding water supply, quality or wastewater. “Irish Water is responsible for managing and delivering water services to homes and businesses served by Public Water Supplies and Wastewater Agglomerations. 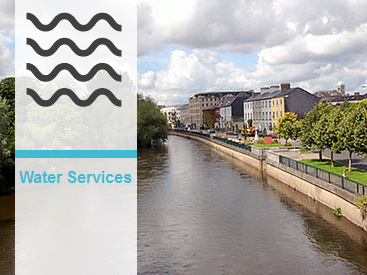 Please note that the Irish Water Customer Contact Call Centre will operate on a 24 hour, 7 day a week basis. Queries made to the Call Centre during out-of-hours will be logged for the next working day unless they relate to an emergency. Emergencies will be passed to the Council for appropriate response, which response will be mobilised as per the current practice in respect of such emergencies. historic water accounts in respect of water and wastewater services used prior to 01 January 2014. Please note that the registration of domestic wastewater treatment systems (septic tanks) and matters pertaining thereto, will continue to be responded to by the Environment Section, Civic Offices, Clonmel and that queries in the future raised by tenants of Council houses in relation to their water and/or wastewater services will not be handled by Irish Water unless they relate to public services. What is a “Remediation of Domestic Lead Piping Grant”? The grant is available to assist owners of premises connected to a domestic water supply with the costs of replacing lead piping or related fittings located within the internal distribution system of the premises, as defined in the Water Services Act 2007. The premises concerned must be occupied by the applicant as his or her principle private residence. Those who qualify will be in the low to middle income bracket, (€50,000 = €4,000; €50,001 - €75,000 = €2,500). Where can I obtain an Application Form and to whom do I apply for this Grant? Tipperary County Council, Water Services, Civic Offices, Limerick Road, Nenagh, Co. Tipperary. What does Internal Distribution System mean in relation to the Domestic Lead Remediation Grant? For the purposes of the Domestic Lead Remediation Grant, this phrase refers to the water system within your home, containing the piping, fittings and plumbing. What is intended by “the curtilage of your premises”? Your garden, path, driveway, or that area of your property, through which pipe network runs in order to connect your home to the public supply. Am I Eligible for a Domestic Lead Remediation Grant? the approved cost of works to be carried out is greater than €200. What supporting documentation do I need for a Domestic Lead Remediation Grant? Both Balancing Statements and Notices of Income Tax Assessment are issued by the Revenue Commissioners. Equivalent documents include signed statements or letters issued by the Revenue Commissioners, showing the Taxable Income for the Tax year before the application was made. Persons with an Income from Social Welfare need a Statement of Taxable Income from the Department of Social Protection. Certification from those Contractors who did the work to the effect that all materials used, (pipes and fittings), are of appropriate quality and that the proper standard of workmanship has been applied. It is the applicant’s responsibility to satisfy themselves that all Contractors engaged are competent to carry out the work and suitable materials are used. Evidence of Tax Clearance for each Contractor engaged to carry out work. It is the Applicant’s responsibility to ensure that the Contractor they engage has such evidence. A Certificate issued within the 6 months immediately prior to the date of application by a Laboratory, which is accredited by Irish National Accreditation Board, (INAB), for testing for lead in drinking water, which shows a parametric value for lead in the water supply at your premises which exceeds the statutory limit. Currently the Statutory Limit is 10 μg/l, (10 micrograms per litre). The Laboratory issuing that Certificate must be accredited by the INAB. DO NOTE - this is not a full list of Accredited Laboratories. Contact the INAB at Phone No 1890 289 389 for a full listing. You do need to have the Laboratory you engage confirm that they are accredited for the purpose of testing for lead in drinking water under the Drinking Water Regulations. If I qualify for a Domestic Lead Remediation Grant when will my grant be paid? Once work is carried out and all supporting documents are on file, there will need to be an inspection of the work done by County Council personnel. You will need to complete a Bank Details form and forward this to the County Council, (Tipperary County Council makes payment by way of EFT). Who is a Water Supplier for the Purposes of a Domestic Lead Remediation Grant? Irish Water is a Water Supplier for the public water schemes. During the National Metering exercise IW will have identified a number of houses where there may be lead piping present. In those cases IW will have issued a letter to this effect to the homeowners. This letter will suffice to attach to one’s application for the grant. You may have a connection to a Group Water Scheme, and that local Group Water Scheme is a Water Supplier in such circumstances. If you are sharing a private well with another user, the owner of the private well is the Water Supplier in such a case. My water source is from my own well. I do have lead plumbing within my home – can I apply for a Domestic Lead Remediation Grant? Yes, you can. You will require a Certificate from an Accredited Laboratory for testing for lead in drinking water. The Accreditation must be by the Irish National Accreditation Board, (INAB). There are other conditions with which you need to comply. I carried out works in 2015 – can I apply for a Domestic Lead Remediation Grant? No the Grant Scheme came into effect in February, 2016. Work carried out before 12/02/2016 does not qualify. Are there Income Limits for the Domestic Lead Remediation Grant? The level of Grant aid available is determined on the basis of gross household income. That is the gross income of the home owner(s). Household Income greater than €75,000 - there is no Grant available. What is intended by the phrase “gross household income” for the Domestic Lead Remediation Grant? Home Owner’s gross income, (that before tax), along with the gross income of the Home Owner’s Spouse in the year prior to that of submitting an application. So where one submits an application on 10th August, 2016, the income documentation should relate to the year 01/01/2015 – 31/12/2015. Is there a minimum expenditure in order to qualify for a Domestic Lead Remediation Grant? Yes, work with an approved cost of €200 or less does not qualify for assistance. How much will households pay in water charges? What decisions has the Government made to date in relation to water charges? Each household will receive a free allowance of 30,000 litres of water supply (and a corresponding allowance for wastewater) per annum (for primary residences only). Each household will receive an additional allocation for every child under 18 (with entitlement aligned with child benefit) to cover the normal water consumption of a child. Charges to be capped for people with high water usage due to certain medical conditions; and Irish Water to take account of the quality of services provided to customers, including circumstances where services are reduced or restricted (e.g. due to boil water notices). Irish Water will receive an operational subvention averaging in excess of €530m in 2015 and 2016, and provision is being made to provide equity of just over €400m in equity to Irish Water in 2015 and 2016 (this is in addition to a capital provision of €240m by way of equity in 2014). This will bring the overall capital programme in 2015 and 2016 to over €400m - €100m higher than current levels. leak identified on a customer’s water supply pipe. that sector receive equitable support by comparison with households on public water supplies. How has the average water charge figure been calculated? costs in detail to ensure that only efficiently incurred expenditure is passed on to customers. When will the actual price for water be known? based on the outcome of this consultation and the policy direction of the Minister. How will the Irish Water bill be structured? For households fitted with an Irish Water meter when charging commences, charges will be based on usage above a free allowance. Each household will receive a free allowance of 30,000 litres of water (and a corresponding amount of waste water treated) a year. To put this in context: the average household (2.7 people) uses about 140,000 litres of water per year in relation to its primary residence. In addition, households will receive from Irish Water a free allowance to cover a child’s normal consumption of water supplied and waste water treated so that charges only apply to adults in households. The allowance per child will be up to 38,000 litres per annum - the level of consumption underpinning this allowance to be verified from actual metering data); charges will be based on usage above the free allowance. The Commission for Energy Regulation (CER) will, following public consultation, determine the water tariff as part of Irish Water’s water charges plan – the CER has indicated that this will be finalised in August. Households connected to the public systems but without an Irish Water meter will be charged on an assessed basis, using a good proxy for usage. The CER will, following public consultation, determine the assessed water tariff as part of Irish Water’s water charges plan, which will be finalised in August. circumstances where services are reduced or restricted (e.g. due to boil water notices). When will households receive their first water charges bill and how will bills be structured? bills in Quarter 1 2015, with bills issued in arrears, similar to domestic electricity and gas bills. What is the timeline for remaining decisions regarding water charges? What is the level of free allowance for water charges? Each household will receive a free allowance of 30,000 litres of supplied water (and a corresponding amount of waste water) a year per primary residence. In addition, households will receive an additional free allowance for every child under 18 (aligned with entitlement to child benefit) to cover a child’s normal consumption of water supplied and waste water treated (this will be up to 38,000 litres per annum - the level of consumption underpinning this allowance to be verified from actual metering data); effectively, water charges will only apply to adults. allowance will be 106,000 litres - more than 50% of their usage. What level will the standing charge for water charges be – will it be 33% as suggested by Irish Water? There will be no standing charge for domestic customers but a minimum charge may be applied to properties that are not permanently occupied e.g. holiday homes. What other affordability measures for water charges are being provided apart from the free allowance? People with high water usage for certain medical conditions will have their bills capped at the relevant assessed charge. Irish Water’s water charges plan will have to take account of the quality of services provided to customers, including circumstances where services are reduced or restricted (e.g. due to boil water notices). If there is no standing charge, will people have to pay water charges on second homes? While water charges will be based on usage with no free allowance in a second home – where they are not permanently occupied a minimum charge may be applied. This will be considered by the CER. Therefore, any water usage in non-primary residences will be charged. What medical conditions will qualify people for the capping of water charges bills? The Minister for the Environment, Community and Local Government will issue a direction to the CER, following consultation with the Minister for Health, the HSE and Irish Water on qualifying conditions, which will for example include people using home kidney dialysis. Will Irish Water’s domestic customers in mixed use premises (i.e. a property with a business and a household) have the same free allowance as domestic customers in households? The CER will make a determination on this following public consultation on the non-domestic tariff structure. However, the Minister envisages that any decision by the CER will be guided by the principle of equity for all customers with a domestic supply. What informed the Government’s approach towards the free allowance, affordability supports and its other decisions for water charges? The Government has sought, through its decisions on the free allowance, to protect larger families and households with single occupants, groups identified through work by an inter-Departmental group (IDG) on affordability measures issues as being potentially vulnerable. These groups and people with high water usage due to medical conditions were also identified by the community and voluntary pillar of social partnership, which engaged with the IDG. The IDG will continue to work to oversee the practical administrative arrangements for the free allowance. Will there be rebates on water charges? The CER has commenced public consultation on the proposed structure of tariffs and this includes consideration of transitional arrangements for people moving from assessed to metered charges. The Minister has indicated his intention that CER should in this context ensure provision for retrospective adjustment of charges including a rebate (above a reasonable threshold). Who is responsible for paying domestic water charges? The occupier of a premises is liable for paying domestic water charges. Under the Water Services (No.2) Act 2013, it is presumed that the owner of a premises is the occupier unless proved otherwise. Where a customer fails to pay a charge, it shall be recoverable by Irish Water as a simple contract debt in any court of competent jurisdiction. How might a rebate system work on water charges? above a certain threshold, than metered usage shows they should have been. What happens if people do not pay their water charges bills? Irish Water will have measures in place to allow for ease of payment of Bills. In the case of failure to pay, Irish Water is empowered to reduce water pressure in order to restrict supply. Water disconnection due to non-payment of domestic water charges is prohibited. If a customer fails to pay a water charge, it shall be recoverable by Irish Water as a contract debt in any court of competent jurisdiction. Irish Water will be required to ensure in the water charges plan submitted to the CER that free allowances are only applied to households who pay their charges in a timely manner i.e. where charges are paid in accordance with the approved water charges plan or an approved agreement. Who will be a customer of Irish Water? Residences in the following cases would be customers of Irish Water. Where the residence is connected to the public mains and a public sewer. Where the residence is connected to a group water scheme and uses a public sewer. Where the residence has its own private well and uses a public sewer. Residences in the following cases would not be customers of Irish Water. What happens after 2016 in relation to water charges? It is anticipated that Government subvention to Irish Water will continue beyond 2016. Decisions on water charges beyond 2016 will be decided in advance of the next Irish Water revenue control period, 2016-2022.
and the utility’s changing financial model as well as the need for extra investment to tackle the current infrastructural deficit. The fact that Irish Water is a commercial semi-state body, with borrowing not included on the general government balance, provides alternatives for more sustainable funding for the sector. What households will receive a free water charges allowance? Primary residences will receive a free household allowance. Free allowances for children will also apply to primary residences. Non-principal private residences (such as holiday homes) will not receive a free household allowance. What happens next in relation to water charges? The CER has commenced public consultation on the proposed structure of tariffs. The Minister will publish the proposed direction to the CER in draft form, and so there will be ample opportunity for engagement on these issues in advance of the final setting of the charges by the CER in August 2014. Consultation by the CER in late June will provide information on the financial costs of Irish Water and the proposed level and structure of charges. Irish Water will deal with all the practical arrangements flowing from the CER consideration and Government decisions, including direct engagement with customers on qualifying for the free allowance as the process develops. Will there be provision for customers to apportion a free water charge allowance between more than one residence? No. The free allowance is for a person’s primary residence. Will there be different payment options for Irish Water? Irish Water will announce details of payment options in due course, as agreed with the CER, which has powers of direction over Irish Water to produce codes of practice relating to performance standards, customer billing, payment methods, Irish Water communication to customers and customer complaints. It is expected that, similar to payment systems for the other utility services, there will be a range of flexible payment options available for customers of Irish Water. Irish Water has signalled its intention to introduce a range of payment options for customers, including an easy payment option for customers who wish to make regular payments of not less than €10 per transaction. Water and wastewater services are expensive and require increased infrastructural investment after years of under investment. The current funding situation, with only approximately 15% of costs borne directly by users, is unsustainable. The public water system requires urgent and increased investment. 23,500 people are on boil water notices. 40% of our water supply is lost on leakage. 16% of our water supplies are at risk, affecting over 1 million people. One-third of secondary waste water treatment plants had inadequate effluent standards in 2012. There is virtually no spare supply capacity in Dublin. With increased investment, these issues can be addressed. In order to secure extra investment in water services (to improve water quality, tackle pollution and address leakage), the Government is applying the user pays principle to water services. Those who use water will pay for it directly. What will happen to households on a group water scheme? The current subvention of group water schemes will be adjusted to align subvention with the free allowance approach towards households on public water supplies to ensure households in this sector receive equivalent support, while allowing for any transitional issues, to sustain improvements in quality in the group water sector. The Department of the Environment, Community and Local Government will consult with the National Federation of Group Water Schemes on arrangements for the group water sector. How do I find out if I will be metered by the time water charges commence? Households can contact Irish Water’s customer contact centre (Ph: 1890 278 278), which will provide an indicative timetable for when meters will be installed in a certain area. How can I proactively monitor my water usage when the meter is underground? People can identify leakage by performing a meter reading before and after a period when the house is unoccupied and no appliance requiring water is in use. This can be done by lifting the lid of the meter, noting the reading, and checking it again after returning. In addition people can regularly check their water meter readings so see how many cubic metres (1 cubic meter equals 1,000 litres) have been used. The average water usage per person in Ireland is estimated at 145 litres per day). What are the details of the free first fix scheme? Irish Water will deliver a free first fix scheme, entitling every household to a free fix of the first leak on a customer’s water supply pipe, between the property boundary to within one metre of a property. The scheme is estimated to cost some €51 million to the end of 2016. Details will be announced by Irish Water in due course. When will the free first fix scheme commence? The commencement date and other details of the scheme will be announced by Irish Water shortly. Will households that have already been metered be able to avail of the free first fix scheme? Yes. The commencement date and other details of the scheme will be announced by Irish Water shortly. What is the annual cost of water services? What are the Regulator’s powers in water regulation? communication to customers, and customer complaints. The Minister for the Environment may give the CER a direction of a general policy nature, which the CER must comply with. Such directions will only be given with adequate reasoning, consultation and advanced notice. currently holding public consultations on the structure of the domestic and non-domestic tariffs, and on customer protection measures. Continues to be in Place, 6th July, 2018. Continues to be in Place, 15th June, 2018. Continues to be in Place, 8th June, 2018.